The Vermont senator is expected to tap into his fervent progressive following. Vermont Sen. Bernie Sanders, whose idiosyncratic 2016 presidential campaign earned him a national following and made him a leading figure in the modern progressive movement, announced Tuesday that he will seek the White House again in 2020. "I am writing to let you know I have decided to run for president of the United States," Sanders wrote in an e-mail blast to supporters officially announcing his candidacy, "I am asking you to join me today as part of an unprecedented and historic grassroots campaign that will begin with at least a million people from across the country." Sanders enters a growing Democratic primary field, which now includes five of his colleagues in the U.S. Senate, with a substantial advantage over his competitors in both name recognition and grassroots organizing strength, but will likely face difficulties in winning over some in the party following an at-times tense 2016 race against former Secretary of State Hillary Clinton. Sanders also made the announcement on Vermont Public Radio Tuesday morning, saying he wanted to give his constituents a heads up about his plans. "I wanted to let the people of the state of Vermont know about this first," Sanders said. "And what I promise to do is, as I go around the country, is to take the values that all of us in Vermont are proud of — a belief in justice, in community, in grassroots politics, in town meetings — that's what I'm going to carry all over this country." In an interview that aired Tuesday morning on CBS News, Sanders was asked what will be different about this campaign than his 2016 run. "We're going to win," Sanders said, "We are gonna also launch what I think is unprecedented in modern American history and that is a grassroots movement." A self-described Democratic socialist and a political Independent, Sanders' campaign brings with it a vast organizing network built during his 2016 campaign that saw him notch wins in key primary states like New Hampshire, Michigan and Wisconsin. While he ultimately fell short in his race against Clinton, his improbable 2016 campaign allowed Sanders to establish himself as a prominent, recognizable and influential voice in Democratic politics. (CJ Gunther/EPA, FILE) Hillary Clinton and Senator Bernie Sanders appear at campaign at the University of New Hampshire in Durham, Sept. 28, 2016. 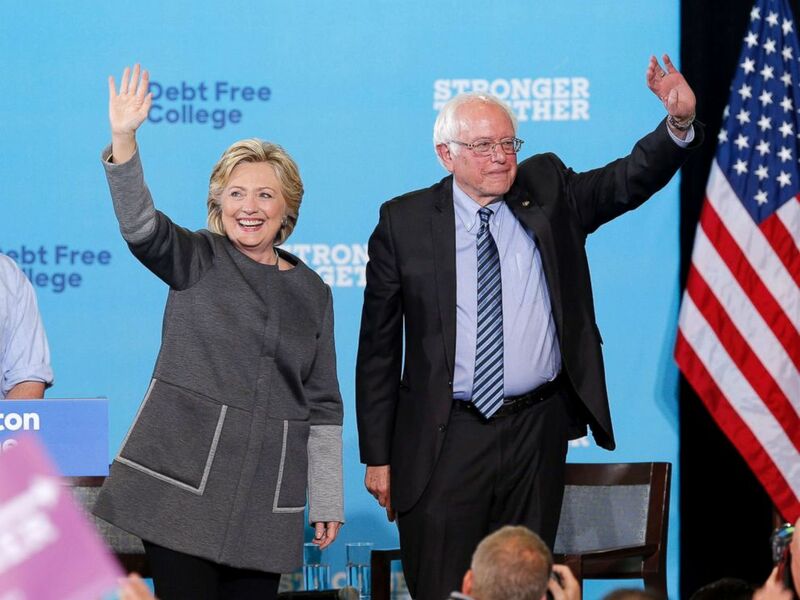 "His name recognition is obviously substantially higher than it was before when we started out with huge majorities in many states who didn’t know who he was... it is true that now he has nearly 100 percent name recognition," Sanders 2016 campaign manager Jeff Weaver told ABC News. The former mayor of Burlington, Sanders was first elected to Congress in 1990 and later to the U.S. Senate in 2006. During his time in Congress and on the campaign trail in 2016, Sanders has fashioned himself as a champion for progressive causes like "Medicare for All," a $15 minimum wage and tuition-free college education, ideas that have steadily gained traction in the Democratic Party in recent months. Multiple Democratic competitors for the party's presidential nomination in 2020, including California Sen. Kamala Harris and New York Sen. Kirsten Gillibrand, have either co-sponsored or signed on to Sanders' "Medicare for All" plan that he has proposed. "All these issues that he talked about in 2016, which were considered to be out the mainstream, are now firmly in the mainstream of both the Democratic Party and the country," said Weaver, who will not be reprising his role as Sanders' campaign manager in 2020. "He was the person talking about these issues when they were not popular, and therefore he is the person that if elected for president people can have confidence will actually pursue these critical agenda items and not trade them away for other priorities." 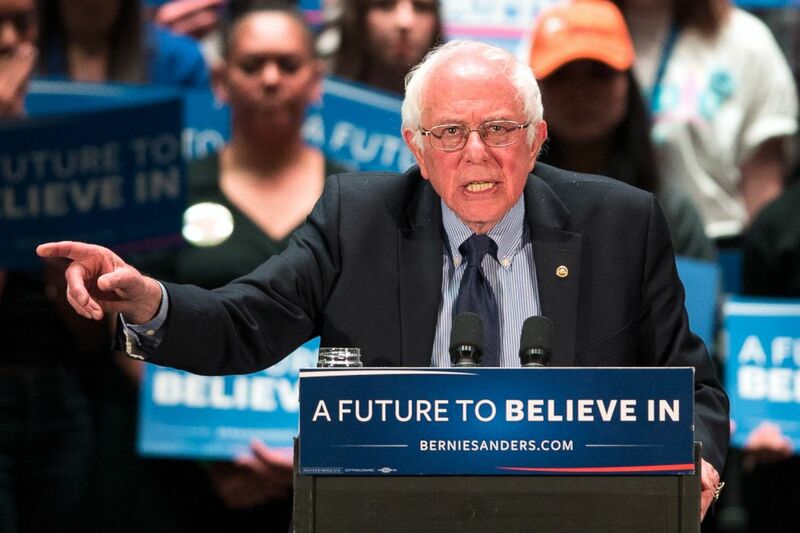 In his announcement email sent out to his vast network of supporters, Sanders also cast the 2020 race as a "dangerous moment," for the country, and, as he did on the campaign trail in 2016 and during his numerous appearances with Democratic candidates during the 2018 midterm elections, labeled President Donald Trump a "pathological liar," and a "racist." (Christopher Dolan/The Times & Tribune via AP, FILE) Democratic presidential candidate, Sen. Bernie Sanders speaks at a campaign stop in Scranton, Pa., April 21, 2016. "You know as well as I do that we are living in a pivotal and dangerous moment in American history," Sanders wrote. "We are running against a president who is a pathological liar, a fraud, a racist, a sexist, a xenophobe and someone who is undermining American democracy as he leads us in an authoritarian direction." But as Sanders launches an ambitious campaign to capture the Democratic nomination, he is facing a number of negative headlines surrounding his 2016 campaign's handling of sexual harassment claims made by women against senior members of his staff. Last month, Sanders apologized to those women, adding that his campaign's standards and procedures for dealing with such claims were "clearly inadequate." Weaver said the 2020 campaign is addressing the issues from the 2016 campaign "forcefully," and is bringing in outside help to ensure a culture "in which everyone feels included and safe." Decisions regarding senior staff and initial campaign travel are expected to be announced later this week, as Sanders officially enters the ever-growing Democratic field eager for a shot to deny President Trump a second term in the Oval Office.